This weekend during the IMERSA Summit 2012 at the Denver Museum of Nature and Science, was the first IMERSA fulldome 101 workshop. This unique workshop highlighted techniques, best-practices, tips and tricks from a unique collection of (13) fulldome educators and professionals in a co-teaching environment. The workshop was organized by myself (Jane Crayton) as a part of the IMERSA Summit, with the intention to integrate all the current technology and techniques used for fulldome content creation and share it with the IMERSA community. Because digital fulldome is a new technology it is important for the developers of techniques for creating in the fulldome share their knowledge with each other in an open-source environment. The future of fulldome production is dependent on expanding technology and techniques through immersive education. The conference also included break-out sessions in (photography, animation, workflow and inflatable geo-dome single-source technology) and, a panel for the fulldome 101workshop where participants were encouraged to ask questions about techniques for fulldome production. We had approximately 35 participants in the workshop which took place at the Gates Planetarium in the Denver Museum of Nature and Science the venue hosting the IMERSA Summit. The workshop seemed to be a huge success, with participants fully engaged in some hands on and immersive learning throughout the day. Ethan Bach of the Institute of American Indian Arts in Santa Fe, New Mexico presented his techniques in teaching students at IAIA using their digital dome. He illustrated ideas in camera techniques in the spherical photography section and contributed to the panel discussion. Bach’s student works were shown in the Geo-Dome during the IMERSA Summit event. Jane Crayton, of IMERSA, Denver Museum of Nature and Science, CU Boulder Science Discovery and University of New Mexico ARTSLab, and STEM-A, hosted and organized the event, introducing presenters and taking care of the details of the event. 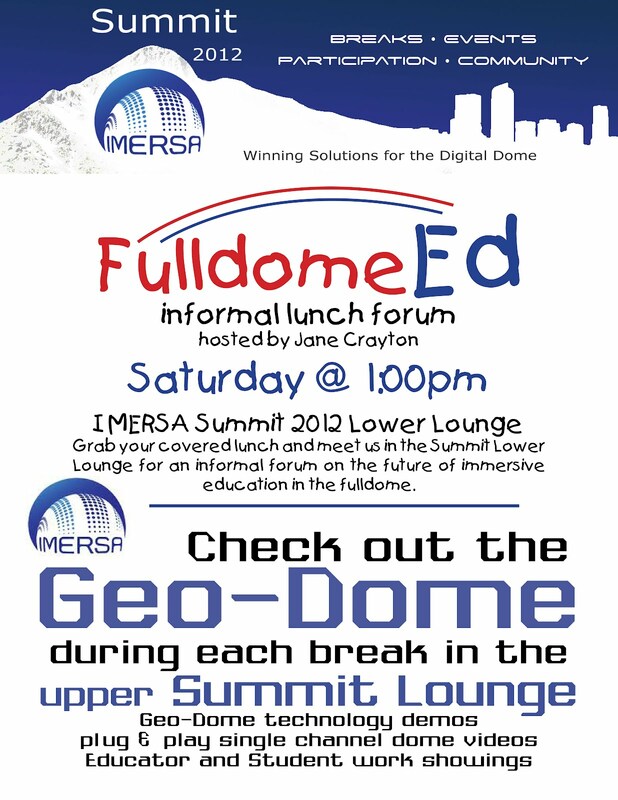 Jane’s student works were shown in the Geo-Dome during the IMERSA Summit. Greg Downing & Eric Hanson of xREZ Studio http://www.xrez.com/introduced spherical panoramic photography techniques using gigapixel (digital image bitmap of 1billion pixels) mosaic techniques and cgi image mapping techniques for virtual immersive experiences within the spherical photograph. He also discussed techniques using a nodal point corrected panoramic photography head, as well as a unique hack for mapping the safe zone of the fulldome inside your camera when shooting with a fish-eye lens. Karen Hatlestad a student at the University of Colorado helped show participants how to work with Blender for the fulldome during the break-out sessions. 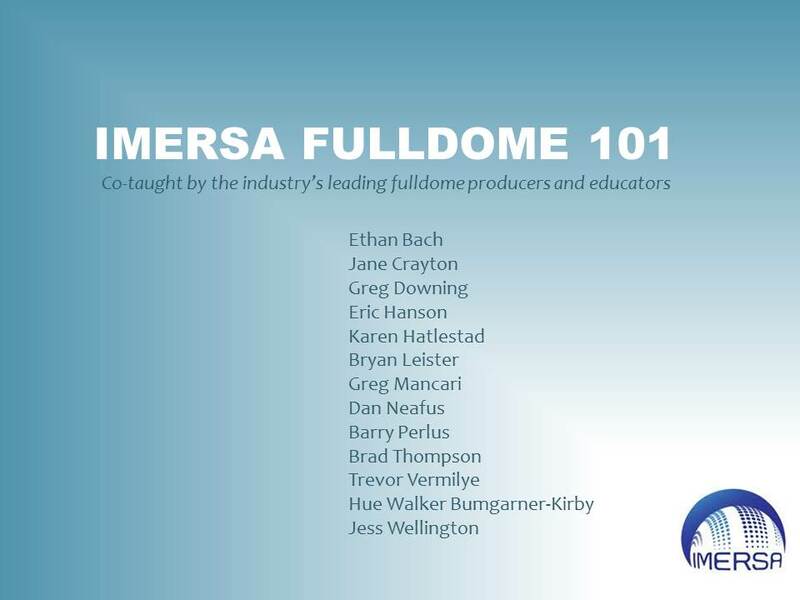 Bryan Leister and Trevor Vermilye, both assistant professors at the University of Colorado at Denver showed their and their students animation works for the fulldome. They discussed techniques and tips for working with Cinema 4D in a dome environment. Greg Mancari presented the Geo-dome single channel technology during the break-out sessions. Dan Neafus director of the Gates Planetarium at the Denver Museum of Nature and Science and Founding Director at IMERSA introduced the basics of the fulldome 101, and the features of the Gates Planetarium to the workshop participants. Barry Perlus of Cornell University discussed teaching his students to shoot panoramic images for the fulldome, and some unique tips and tricks he has learned working with students in photography. Ben Shedd Peabody and Academy award wining film and video producer discusses his Exploding The Frame theories for fulldome production. Brad Thompson of Spitz Media discussed techniques for content and animation production for the fulldome. He presented clips of projects and workflow techniques for producing in an immerisive environment. Hue Walker Bumgarner-Kirby of the ARTSLab at the University of New Mexico held down the main stage of the workshop by presenting how she works with media content in the fulldome. Hue introduced basic concepts in the introduction, and lead the workflow section. She also contributed to the animation session discussing her techniques using Maya for the fulldome. Jess Wellington of the Gates Planetarium at the Denver Museum of Nature and Science introduced workflow techniques for pushing pixels into the dome. He covered the use of Adobe After Effects and the use of the fulldome plug-in tool. The intention of the workshop was to give an overview of production for the fulldome within a one day intensive. The workshop was aimed at persons who were looking to expand their knowledge of fulldome production from entry level to advanced. There were multiple opportunities for participants to interact with the presenters and create a dialog unique to their personal and professional needs. I am looking forward to collecting surveys on the workshop and how I could improve it for next year, what the benefits were and what was most gained from the experience. It was an exciting opportunity, and despite the bad weather that threatened to close the museum the day of the workshop, we ended up being able to use the planetarium the entire day since the museum was essentially dead as the city was covered in over 15 inches of snow. Additionally on Saturday during the Summit, I hosted an informal Fulldome Education forum during the lunch hour which was a great success, with about 8 attendees, and several others who wished they had participated. Very cool, were there any recordings? The workshop was recorded. Video will be published on the IMERSA.org website. I will announce when those videos are available. Thanks for your interest!